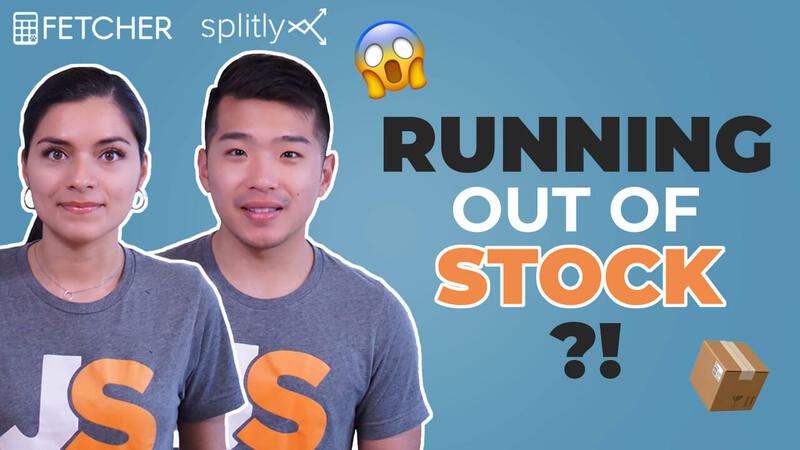 We’re covering all of this today in episode 19 of Seller Strategies: Running Out of Stock. Watch the video, keep reading and don’t forget to subscribe to our YouTube channel so you never miss an episode! Today, we have a very exciting topic. We’re going to talk about how to prevent running out of stock. We will also be sharing the exact strategies that we use to minimize the damage of running out of stock. To kick things off I would like to share a little insider secret of how I keep track of my inventory. Lower your PPC spend gradually. The reason that you want to do this is because it’s going to help you slow down sales and to give you a couple days worth of time. Amazon typically gives you a negative mark when you run out of stock. By closing your listing a few units before you actually run out of stock, you’re actually telling Amazon that instead of being out of stock and not being able to serve their customers, you’re voluntarily pausing your selling because something might’ve happened. That way, when you’re back in stock and you reopen your listing, it’s not going to be as hard to climb the rankings ladder because Amazon didn’t penalize you completely for running out of stock. When do I start to lower my PPC spend? When do I close my listing? To determine this I use my average daily sales as an indicator. If you have Fetcher, you can very quickly find this number on your dashboard under the Inventory Levels widget. As you can see, the fourth column from the left is calculating your average daily sales. Furthermore, the last column in the inventory widget will tell you how many days you have remaining. As a general rule of thumb, you should aim for one to two days worth of stock before you close your listing. 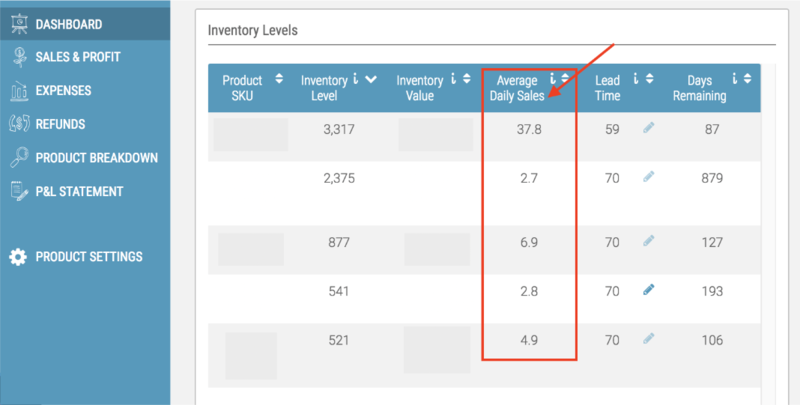 You want to create this buffer so that you’re not completely out of stock and you can still send replenishment orders from your inventory to customers in case they received damaged goods and need a replacement. What if I already ran out of stock, what then? Let’s say you have 1,000 units about to leave your supplier’s location. Take a portion of that and send it via air freight. So the breakdown may something like 100 units being shipped via air freight and 900 by sea. That way, you don’t completely run out of stock or at least it buys you more time where you continue to sell and then not run out of stock for as many days. When it comes to running out of stock, it’s very important that you don’t lose your ranking and your sales velocity from Amazon’s algorithm. That’s more important than profitability because it’s temporary. By the time you go back to where you were before with your ranking and your sales, you’ll be able to make up the profit. Granted it is going to cost a bit more to ship via air freight, however, that small difference of airing some units just to prolong your stock goes a really long way. As soon as your product is back in stock at Amazon’s warehouse, you want to pump up your PPC spend. What we recommend is that you pump up your PPC spend a minimum for the first one to two weeks in order to increase your sales velocity. In your Amazon Seller Central account, you’re going to see a widget titled “Inventory Planning”. I would strongly recommend you get familiarized with this tool and to help you get a better understanding of how it works I encourage you to read this article. It’s a great resource put together by the Forecast.ly team. I hope that these tips are something that you never have to use because who likes running out of stock? It’s not a good position to be in, but in case you do find yourself in this position, now you are armed with the tools to get your Amazon business back on track. That’s it for today, however, tune in next week as we continue to share our best tips and tricks to help you succeed as an Amazon FBA seller.